Both Federal and State withholding calculations are now managed in what is referred to as an enhanced tax jurisdiction/tax package. 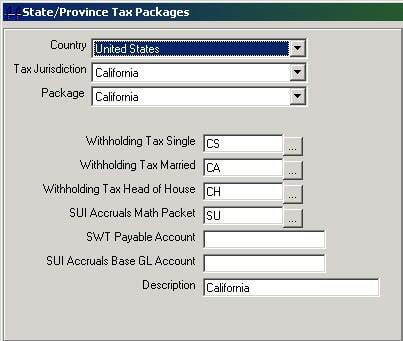 The familiar math packets can be managed here for tax packages, which may then be used for each employee. You may setup as many enhanced tax jurisdiction tax package, as you wish, to accomplish your needs for withholding taxes. For instance, you may setup a “standard” package with normal taxes withheld, and a different package for exempt employees, employees with no state or federal withholding, etc.